SwitchMaster 1U ganged A/B switches and multiport sharing switches are compact multi-switch systems in a 1U high rack-mount chassis. 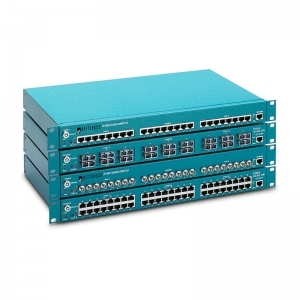 Fiber optic or wire Ethernet switch port models are available. Multiple racks can be daisy chained together (up to 4080 circuits), all controlled by a single user locally or remotely. Manage access to networks, implement backup systems for network and computer connections or share peripherals and other equipment. Local features include LED status and manual switching. Remote control (RS232 and Ethernet available as standard options, dry contact closure available as a custom) provides unmatched management flexibility. SwitchMaster systems are used around the world to add secure access control and reliable backup for critical systems from space launch centers to stock exchange networks.